After Mayor Rahm Emanuel’s commitment to build 100 miles of bike facilities in four years, the city started repaving, restriping, and redesigning their streets. 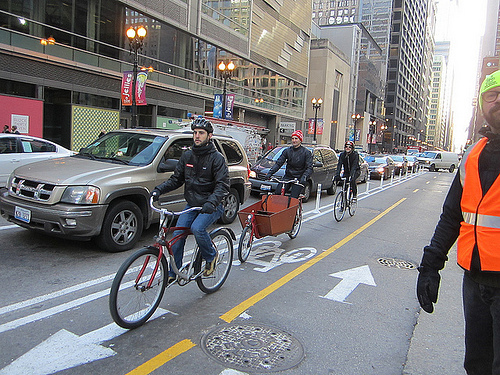 Projects like those on Kinzie and Dearborn Streets demonstrated that cars and bicycles can co-exist on busy city roadways. The city announced its newest plans for protected green lanes on Milwaukee Avenue in West Town on April 30th. And if you read this article in the Chicago Sun-Times, you might think that local residents and businesses were opposed to the project. 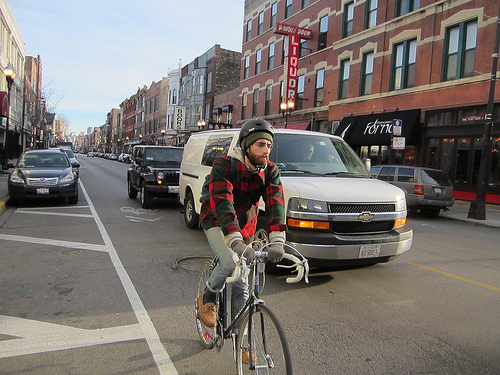 As business owners on Milwaukee Avenue, we fully support the city’s proposal to install protected bike lanes, reconfigure parking and make safety improvements on our street from Kinzie to Elston. We appreciate the city’s thorough outreach on this project. Unfortunately, the perspective of the many residents and businesses that support the project wasn’t included in the Sun-Times May 1 article, ?Tension rises at city bike plan hearing.? These street improvements for the city’s most popular street for cycling will make our neighborhood safer for everyone and help our businesses grow by creating a more livable street. By framing the issue in terms of cyclists vs. anti-cyclists, your coverage overlooks the fact that most city dwellers (and business owners) don’t fit into exclusive categories when it comes to how we get around. We all benefit from safer streets with more orderly traffic. A close look at the public plans shows that there’s a lot more than just bike lanes and parking spaces going on — overall it will make our street a more comfortable place to hang out, helping us to attract more customers and greater investment into our neighborhood. What we’re up against here is a chaotic and unsafe roadway that stifles economic activity. This is the story you should be telling. We?d like to join our friends at the Active Transportation Alliance in giving a big shout out to Tim, Chris, and Angelo. Thanks, guys. We couldn?t have said it better ourselves.